It’s not often you get to have an experience like the one I just did. 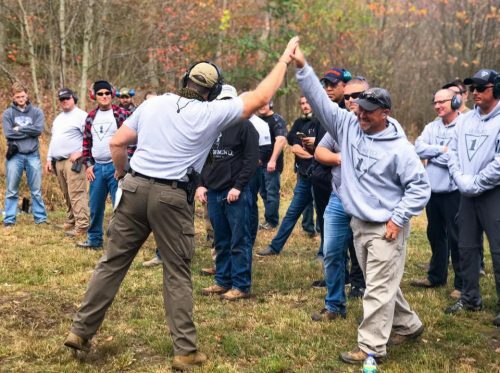 Myself, along with 40 other men, just spent the last 36 hours together in the woods being trained by a former Navy Seal turned Pastor (yes you read that correctly). Jim O’Connor is the founder of Guard (Gather Understand Attack Retreat Decompress) 1 Warrior Training. To say it was a blast would be an understatement! Yes we learned the proper technique to fire guns from a former Seal. Even more importantly though was Jim’s unique perspective on what it meant to be a man who would give his life to protect his family. Leadership doesn’t start with our government or even with our schools. Leadership starts at home. All our societal ills can be traced back to a failure of men leading their families in their own homes. Being a man starts with being the leader of your home. I’m going to be a better leader of my family because of what I just experienced at Guard 1 Warrior Training. Something tells me that 40 other MEN will be too!